If you wish to insure your products then you can do that by using the WooCommerce FedEx Shipping Plugin. Moreover, this information will be automatically passed on to FedEx right from the plugin. In this very article, we will show you how this plugin can help you declare the insurance cost of a product. So, let us quickly jump right into the article. FedEx uses the best-in-class transportation services and quality package handling methods. However, there is a very small percentage of chance that they might fail to deliver the product in working condition. This is the reason why shop owners tend to insure the products before handing them over to FedEx. If your product is insured then FedEx will reimburse you for the costs incurred to repair or replace it up to the declared value. Usually, store owner defines only the manufacturing cost as the declared value of the item in the case of insurance. 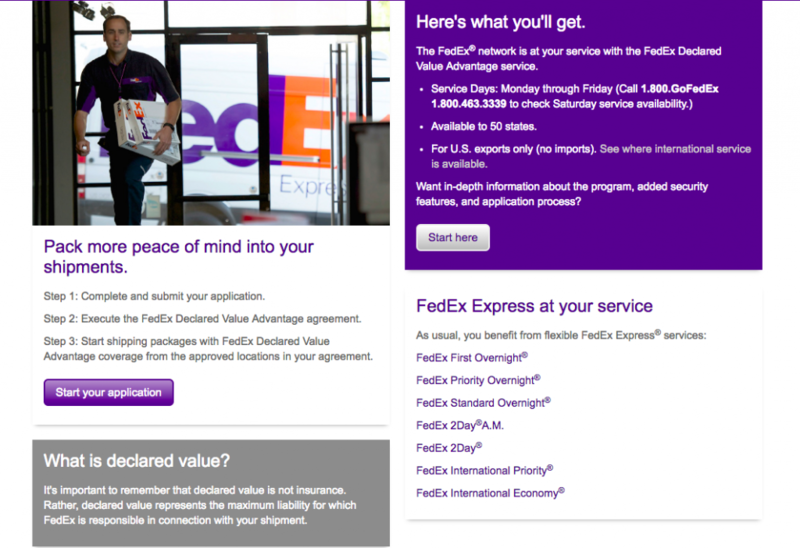 So if you ever need to file a claim then you will have to provide the information to FedEx at the time of shipment. But there are a lot of things to think before insuring an item from your store. Most importantly, the shipping cost of an insured item will higher than shipping a non-insured product. In the case of a claim, you might need to wait for a longer period of time for the reimbursement. In some cases, this period might extend more than 60 days. Setting up insurance cost may prove to be a tricky affair. Let us take an example of a business case. A shop owner wants to declare the insurance amount to be equal to the cost of making the products instead of being equal to the sales price. For instance, if one of their products costs them $325 to make (including materials, labor, etc..) but they sell this product for $475 to the customers. They want to insure this product for just the cost of $325. FedEx does not reimburse for damaged products based on the sales price. They only reimburse based on the cost to replace the product (i.e. manufacturing cost, which is $325). FedEx has also mentioned this clause in their terms and conditions. Therefore, it is a waste of money to insure a product based on the sales price. By using our plugin a store owner can easily define an insurance amount for any product. In this business case, the store owner needs a field in the FedEx plugin that allows us to enable the Insurance option. Furthermore, they can put a custom insurance value for each product since they may have several products with different costs and prices. Moreover, if multiple items are selected then the custom declared value (insurance) for each packaged product can be calculated independently. And yes, the WooCommerce FedEx Shipping Plugin does all the above. Let us see how does this plugin does that. The insured value of a product can be defined on the individual Product page. As you can see in the image shown below, there is an option to give a declare the value. Once the insurance amount is declared for a product, the plugin will send the amount to the FedEx servers. Based on this request the shipping rates will be shown. If you see in the video below, you would notice that the shipping cost changed as soon as the declared value was entered. In the above video, we had taken only one insured product and showed you how the complete process is executed. If you have multiple insured products in the Cart then the insured value be taken individually. The total insured amount will be added together and this value will be sent to FedEx. Based on this value the shipping rates will be calculated. In the following images, you can see that we have two different insured products in the Cart. Moreover, the insurance amount of these products are different as well. In the Debug Request, the total insurance amount will show up something like as shown in the following image. This is the most efficient way to secure your products while availing the various FedEx Shipping services. So this article covers one of the most important functionalities related to shipping methods of the FedEx Shipping Plugin. This can help a lot of store owners to customize the way they insure and ship their products to their customers. The need to add a declared or insurance amount has been a highly requested feature for quite some time now. According to this article, the WooCommerce FedEx Shipping plugin is the best way for the store owners to make sure their products are packed and deliver the way they want. At the same time, store owners can also make use of other features such as such as shipping labels, showing estimated delivery dates to the customers, shipment tracking, and much more.